Known for being the motherland of the spirited outlaw Robin Hood, Nottingham has a thriving housing market for both the rich and the poor. The city sits 128 miles north of London, in the East Midlands. 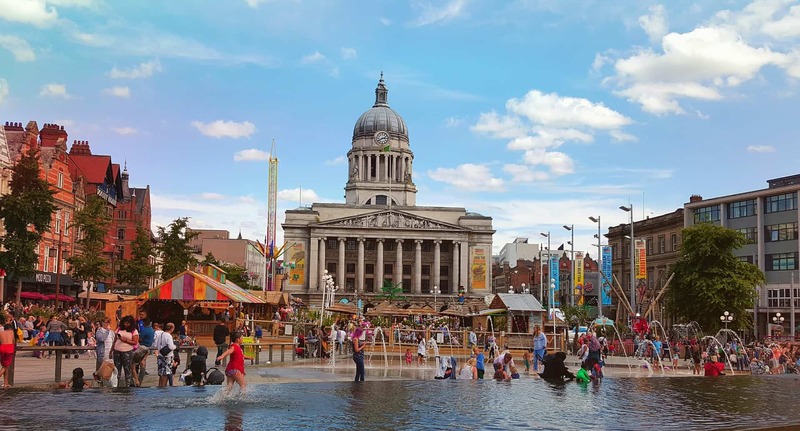 With two universities in the city, Nottingham plays host a thriving city life. The Nottingham property market also continues to flourish, with more than 1,500 homes, canalside bars, hotel and restaurants planned on the “Boots Island” wasteland in Nottingham’s Eastside. If built, the bars, restaurants and reported five-star hotel, could bring in hundreds of jobs for local people. If you’re considering selling your Nottingham property, or purchasing property in the city, we have all the information on the Nottingham housing market to help make your decision. Research released last year by Savills, suggests that Nottingham is estimated to outperform London based on house price increases over the next five years. 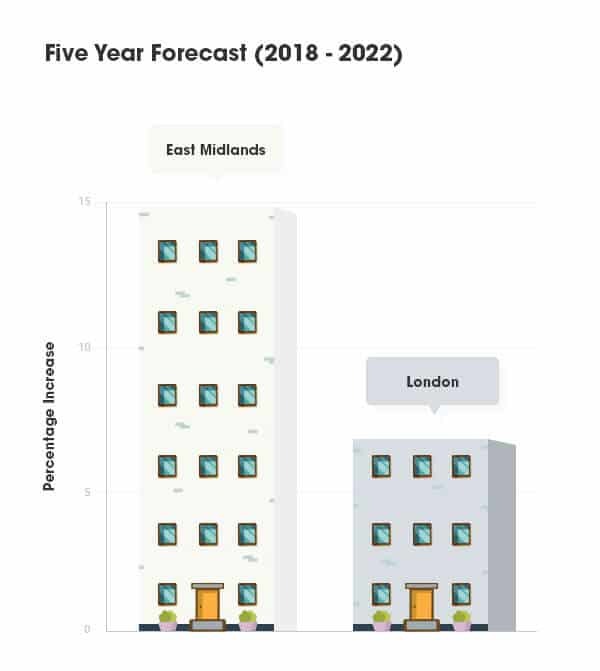 East Midlands’ five year forecast is predicted to be an increase in house prices of 14.8% between 2018 and 2022. This is over half of London’s estimated growth, which stands at a predicted 7.1%. When it comes to selling your house, you want the process to be as quick and simple as possible. According to the Rate of Sale report issued by Post Office Money, the average UK property takes 96 days to sell. Nottingham sits a little under this threshold, with an average of 74 days on the property market. The Nottingham housing market is showing substantial growth, and if the five year predictions are correct, homeowners planning on selling their property could be in for a high asking price. It’s not all good news though, the growth will hinder those who wish to buy, including first time buyers, who may be put off from buying with higher prices. If you’re looking to sell your home quickly in Nottingham, you should ensure that you market and sell your property properly. If you choose the traditional method of selling via an estate agent, be sure to fix any leaky taps and touch up any peeling paintwork that can put buyers off. You could also minimise any clutter and give your garden and outdoor space a spruce up too. Alternatively, property house buying companies such as Good Move, will buy any property regardless of condition. Please feel free to contact one of our property experts who will be able to assist you. Redhill, a town in Surrey, is part of the London commuter belt and is fast becoming a desirable area for homeowners. With an average house price of around £369,088, the town is attractive for buyers who have a little more cash to spend. Regeneration works to the city centre are currently underway and are expected to be completed in 2019. Flats, shops and cinema are just some of the works that are predicted to be undertaken in the £1.5 million regeneration scheme. For those who prefer the quiet, rural life, Cotmanhay may be the place for you. The village, situated in Derbyshire, is famous for its textiles and coal mining in the 19th century. House prices in Cotmanhay are modest, with an average price of £132,810, meaning it’s an ideal area for first time buyers or those who are retiring. Loughborough is a town in Leicestershire and is the home of Loughborough University. With an average house price of £200,414, the town is ideal for first time buyers and families. There are several regeneration projects planned for Loughborough, including 170 new homes for the Sileby area and extensive work on the Loughborough town centre. What’s next for property sellers in Nottingham? If you’re considering selling your Nottingham property, please get in touch with our property experts at Good Move. It’s a known fact that one in three property transactions made through estate agents fall through due to house chains, so it’s a much easier process to sell through a fast property buyer and take the hassle out of selling your home.